Got a daring sense of adventure? Want a bird's-eye view of Maui from about 38-stories high in the air? 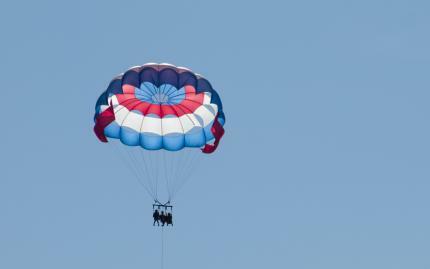 Try parasailing, where you are equipped with a life jacket and a harness and then attached to the already inflated parasail and gradually let out to your desired height of 800 ft.
Parasailing is as uplifting as it sounds, and during this ride, you'll find that out firsthand while soaring over the scenic ocean waters of Maui! Let your worries fly away as you use equipment approved by a Coast Guard safety check and cruise out to your take-off point on a top-of-the-line boat (yes, the same boat that will be pulling you through the air). In other words, you can focus on having fun! .....that is, so long as don't forget to open your eyes! 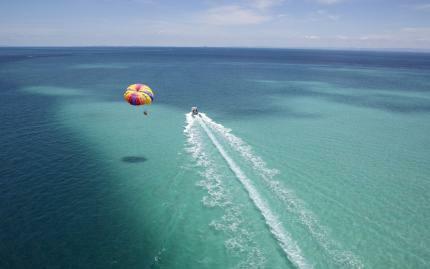 Note: The parasail ride is 8 - 10 minutes in duration and the boat ride is about 1 hour. The minimum weight to fly alone is 130 pounds. 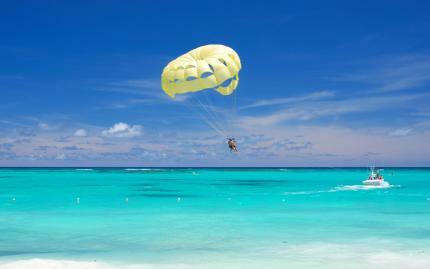 Flyers must be at least 6 years old to parasail. Please do not participate if you are pregnant or have recently had back or neck problems.